Summer in the city is how I always remember it to be. The days are long, hot, sticky with humidity, and constantly buzzing with life. For all of its unbearable qualities, there is an atmosphere that is inescapable in its ability to make us want to linger outside at night, together, for just a bit longer, over drink and food, reveling in this new found freedom that summer always brings. My garden is full of mosquitos at night, and sunshine in the morning. Late night train rides feature happy, drunk passengers, and the evenings more often than not bless us with a pink or red sunset that engulfs the city and hides all of its imperfections that normally dictate our everyday life. This is the natural relationship with New York City that I think most people who inhabit this complex place experience; the back and forth of being completely overwhelmed and beaten down by the things that make us deeply hate this strangle cluster of islands, and then occasionally we are shown it's potential for physical beauty and for beautiful interaction, as we congregate together in the streets at night illuminated by the lights of restaurants, apartments, bars, or in the backyards of our favorite people enjoying a barbecue, some wine, a cold beer, a freshly baked pie. My time here is short and slowly dwindling, as I get closer and closer to the day I move for the first time out of my parents home and away from this city I have lived in for nearly 10 years. Although I am overwhelmed with excitement for this new change in my life, this short time I have had here, at home, has reminded me of the reasons why I have called this place home for so long, aloud and in my heart, despite the push and pull I feel when I think of my place here now. Below I have a few summer recipes of some of the food I have eaten over the past two weeks, all of which to me feel like they feature essential summer elements in their ingredients. first, preheat the oven to 400˚F/200˚C. then slice the beets into about 1/4 inch think pieces, place them in the roasting pot, and toss them in the olive oil. then salt and pepper them. second, in the small jar or jug, combine the vinegar and honey. 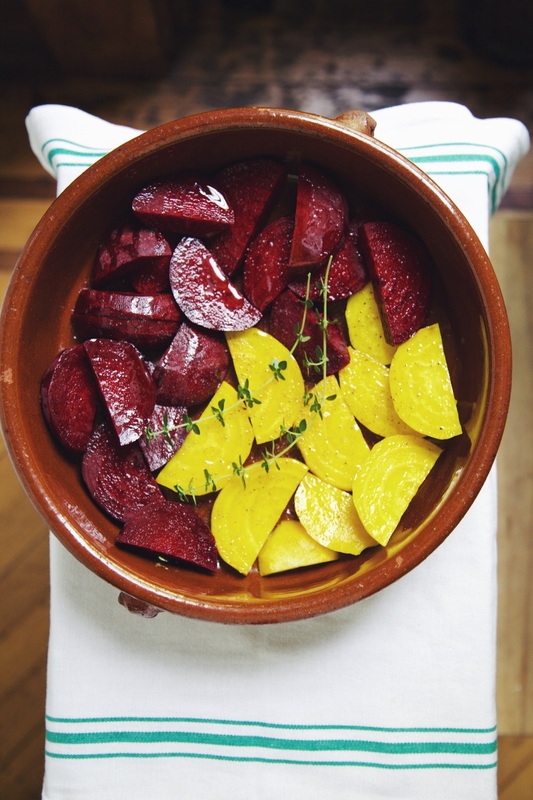 cover the beets in your dressing them place them in the preheated oven. 1 large egg yolk, at room temp. first, preheat the oven to 400˚F/200˚C. in a food processor add all of the dry ingredients for the crust, and pulse a few times to mix. then add the cold butter in cubes, and pulse about 10 times until the butter is in fine pea sized crumbs. whisk the egg yolk with 5 tablespoons of ice water. add this to the dry ingredients and pulse a few time until it starts to come together in a ball. add the last two tablespoons of water if the mixture is too dry and isn't coming together. dump the dough onto a brown rice floured work surface and knead a few times until it comes together in a flat disk. wrap in cling film and place in the fridge for at least 1 hr. once chilled roll it out onto and floured work surface and line your tart tin. line it with baking paper and fill the bottom with baking weights. bake for about 20 mins, turning halfway through. then take it out and brush with a mixture of egg white and a splash of water. then put back in the oven without the pie weights for 10-15 more minutes, until just olden brown. second, in the heat proof bowl mix the lemon juice, honey, and salt. then fill your small pot with about 2 inches of water, no more, and put on to simmer. once the water is hot whisk in the eggs and egg yolk into the lemon juice mixture. then rest this bowl over the small pan over hot water, but make sure that the bowl isn't touching the water. continuously whisk this mixture, to prevent the eggs from scrambling, until it thickens enough to coat the back of a spoon, about 5-10 minutes depending on how hot your water is. let the curd cool to room temperature before folding in the creme fraiche. then spoon this mixture into the cooled tart shell, level it out, and place in the fridge for at least 1 hr to set. This is one of my mom's favorite summer pasta recipes. She is frequently inspired by the Franny's cook book, and experiments with new and simple meat-free dishes for my recently self declared vegetarian sister, hence this dish. first, turn the heat on to a large heavy bottom pan (big enough to add you pasta at the end). add a good guzzle of olive oil and the onions, and sauté to medium soft on a medium heat. just before it starts to brown, add in the garlic, you don't want to burn the garlic so turn the heat down a wee bit if you need to. sauté for about 5 mins, then turn the heat up high, and add the squid and sauté. keep it on high and with a flat bottom wooden spoon ensure that you keep things moving in the pan. after about 7-8 mins turn heat down to medium. there may be some liquid from the squid, which you want so don't loose it. second, put your pasta water in to boil. add the tomatoes to the squid and continue to sauté, then add some kosher salt and cracked pepper. once the tomatoes have softened and become incorporated, turn the heat down to simmer. if there isn't a lot of liquid I sometimes add a wee bit white wine, or a wee bit stock. then add the garbanzo beans and stir to incorporate. third, once the pasta water is ready, add your pasta ensuring that you have heavily salted the water. cook until al dente. once you've gotten your pasta to almost al dente, add it to the squid and incorporate over a low heat for about 1-2 mins. check the pasta to see how al dente it is and how you want it. if you think it's too dry, I add a wee bit of the pasta water but it shouldn't be too dry. lastly, take off the heat, add the chopped cilantro thoroughly incorporating it all. to finish it off, I add some Maldon salt, cracked pepper, lemon juice and zest ( to your liking and taste) and sometimes I finish with a wee guzzle of good olive oil. plate it up and enjoy! Last week, after 18 hours of travel had turned into 20 from a two hour delay spent on the tarmac, after my pack had begun to dig so aggressively into my chest that I question whether I have received permanent nerve damage below my collarbones, after the unsettling realization that my days would be no longer be spent strolling the streets of Barcelona or Florence began to move its way into my mind; I stepped out of the arrival gates of JFK airport and spotted my mother jumping up and down, waving, over a sea of other passengers amidst reunions; and as I weaved my way through this buzzing crowd, moving closer to my mom whom i had not seen in 5 months, I started to realize the necessity that is returning home. Sometimes I have a spotty memory, or more so selective, in that I can remember so clearly an interaction I had with someone years ago, but not what I ate for dinner last night or where I was three days ago. Part of that has just been a symptom of not clearly knowing what day of the week it is, because your only indication of time is loosely counting down the days until you move onto your next destination. Returning to a place where everything I'm surrounded by is familiar and holds countless clear memories of my many years living in this Brooklyn house and in this ever-changing neighborhood. So when I try to remember where I was four days ago, or last week, or two weeks ago I struggle to accept the images I conjure up in my mind. I still have so much I haven't put up here, and definitely more so than anything else my posts on the beautiful and very different places I have been to this past month that I will eventually upload will be more so for the purpose of jogging my memory than anything else. For now I am simply taking it slow. Jet lag and a lack of formal daily plans to trek across an entire city and battle herds of tourists, has me up at 6:30 sharp nearly every morning. And as a result my parents' kitchen is not only always in a state of creation but the oven is getting little resting time between, pies, scones, a few attempts at babka, and my first attempts at a sourdough starter (I have been intently reading the Tartine Bread book). Within 12 hours of being home (we arrived late at night and of course were up at the crack of dawn), we were already doing our Saturday shopping at the grand army plaza farmers market, me picking out punnets of strawberries to, naturally, make a pie. The only obvious way to welcome myself back into my home and kitchen. So here I have posted below my recipe for a Strawberry Pie flavored with rosewater and cardamom spice. Which we enjoyed together in my back garden, post fish tacos and getting attacked by mosquitos as the sun went down. first, preheat the oven to 425˚F/220˚C. Roll out your pie dough and line a buttered pie pan. next take your washed, hulled, and quartered strawberries, sprinkle the 2 tbsp of sugar over them and set them aside for 20 minutes to macerate. then peel and grate your apple, adding the lemon juice to it then setting aside for later. in another bowl prepare your spice mixture. combine the rest of the sugar, spices, arrowroot, and bitters, and toss to combine. second, once the strawberries have macerated in the fridge for at least 20 minutes, discarding excess liquid that has built up at the bottom of your bowl, add the strawberries to the bowl with the spice mixture. then pour over your rosewater, add the grated apple and lemon juice, and toss it all to combine. sprinkle one tsp of flour and one of white sugar over the base of your pie plate to soak up the juices and pour the filling into the pie plate. I decided to give the top of my pie a mismatched lattice and played around with some braided edges (that needed some work), but you can essentially top it however you like, leaving some space for juices and steam to escape. then chill the pie in the freezer for about 5 minutes to firm up. brush with egg wash and sprinkle with sugar. lastly, bake the pie on a pie tray in the middle rack of the oven. bake at 425˚F for 20-25 minutes, then turn 180 degrees and lower the temperature to 375˚F/190˚C. bake for another 30-35 minutes, check occasionally to make sure it isn't burning. you can turn down the temperature slightly but aim for 1 hr total baking time. it should be golden brown. and the bubbling of the fruit should subside. let cool for a least 1 hr before serving. This past Monday we celebrated the day dedicated to my favorite thing to eat and make. Maybe not dedicated to exactly, more so jokingly associated with it, but I was never any good at math so I'll take pie instead. It is finally rhubarb season, one of my favorite things to bake with. As a child I used to hate rhubarb, or maybe more so I was just put off by its strange likeness to celery and could never imagine that something delicious could be created with it. Nonetheless Strawberry and Rhubarb is now one of my favorite pies to make. The tartness of the rhubarb paired with the sweetness of the strawberries allows for a balance that prevents one flavor from overpowering the other. The pies in this post are a little crispy because I am not used to working with a fan oven at home, and as usual I was borrowing someone else kitchen again. I have also included step by step instructions (with gifs!) of how to make my favorite pie pastry dough from Four and Twenty Blackbirds. This pastry provides just enough flake, while also maintaining structure in the face of overly juicy or wet fillings. The recipe I have written out bellow is for the Double Crust portion, which makes enough for a bottom and a top crust (or lattice), of a pie. I recommend you always make extra dough and just go for the Double Crust recipe. But if you are looking for just enough dough for a single bottom crust, then half the recipe to get a Single Crust portion. Any left over dough can always be frozen and used at a later time! First, measure out the cold water and the apple cider vinegar and put it in the fridge to stay cold. Cube the cold butter and put it in the fridge to stay cool. Then in a large bowl, mix the dry ingredients. Take about half of the cubed butter and add it to the flour mixture, put the rest back in the fridge. Second, rub the butter into the flour. Try to use only your finger tips to rub the mixture, as your hands will be too warm and will melt the butter, resulting in tough pastry. Once most of the butter has been incorporated and there are few large clumps of butter left, add the rest of the cold butter, and rub that into the mixture. You should work it until you have between fine and pea sized crumb consistency. It doesn't have to be entirely even, but you shouldn't have any clumps of just butter. or pockets of flour left. Third, make a well in the center of your flour and butter mixture, and pour some of the wet ingredients into the middle, about 3-4 tablespoons (or 1-2 if doing a single portion of the pastry). Then, keeping your fingers together like a paddle, work the water into the flour. Making a dough come together is definitely the most tricky part of making the pastry, as this is where you run the risk of working it too much. This melts the butter which makes the pastry tough and very difficult to work with. But this is actually easy to avoid as you just have to keep making sure you don't allow too much pastry to get stuck between your fingers, because this is where the warmth of your hands will melt the butter. There are a few methods to bring the pastry together; try pressing the flour onto itself, or the claw method where you stir the mixture with your fingers spread apart like a claw, but remembering to remove any pastry that gets stuck to your fingers. Keep adding little splashes of the water and cider mixture until the dough can be shapped into a ball. You might not use all of the wet ingredients as the dough shouldn't be entirely wet, but not flour-y enough that it doesn't stay together when shaped. Lastly, once the pastry can come together in a ball without falling apart, turn it out onto a clean flat surface. Cut the mound in half. then shape the halves into two flat rounds. Then wrap the rounds in cling film securely so that there are no parts of the pastry exposed. Then place them in the fridge to rest. It is very important to let the gluten in the pastry rest, and let the dough become cold in order to roll out. You can leave the pastry in the freezer for up to a month, just let it defrost in the fridge, or you can leave it in the fridge for up to two weeks, if you are not using it immediately. But let it have at least 30mins-1hr before rolling out if you are using it on the same day. first, preheat the oven to 425˚F/220˚C, then roll out one half of the pie dough into a large circle. grease a pie plate with butter, then line it with the dough, leaving about 1 inch extra hanging off the rim. take about 1 heaped teaspoon of flour and of sugar, mix, and spread out on the base of the crust. this will soak up juices when baking, and prevent a soggy bottom. pop this into the fridge to stay cold. second, in a large bowl, combine the sugars, arrowroot, spices, and salt. then add all of the fruit and toss to coat the fruit in the spice mixture. then whisk the 1 egg with the dash of bitters. add this to the mix, and stir to combine everything. third, take the other half of the pie dough, roll it out to similar thickness as the base. cut out six large strips for a lattice. then pour the fruit into the pie plate, juices and all. top with a lattice. fold the extra pastry hanging off the rim into itself and press to seal. then crimp if you please, or leave it, whichever you prefer. lastly, place on a baking tray, egg wash the pastry, and sprinkle all over with Demerara sugar. bake for 20-25 minutes or until the pastry starts to turn golden. then turn completely and lower the temperature to 375˚F/190˚C, and bake for another 30-35 minutes, or until the pastry is deep golden brown, and the bubbling of the fruit around the edges subsides. allow to cool for 30 minutes before slicing up. Serves 8-10.